I started getting interested in cars as a teenager in the 1980s. These were the days of the Countach versus the Testarossa, and later the 959 against the F40. But another battle was in progress a little further down the food chain: This was the battle of the offspring of the horsepower-fueled insanity that they called Group B rallying. Famous names in this particular turf fight were the Metro 6R4, the Ford RS200, the Peugeot 205 T16, the mighty Audi Quattro S1, and Lancia’s own 4WD step up from the formerly-dominant 037 – the Delta HF Integrale. 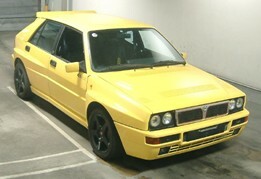 The Lancia was a little later on the scene, but was born from the same gene-pool as these other crazy machines. Unfortunately for Lancia, rallying dominance did not translate into sales as their other cars were critically panned, with Lancia as a brand withdrawing from many markets not long after. Here is a nice example in the Japanese car auctions today with mileage under 65,000 KM and little work needed to clean it up. Looking at previous sold prlces, I expect this will go for between 1.2 and 1.5 million Yen.